When you think of fashion, the first thing that pops up in your mind probably isn’t 3D printing. Although technology and fashion may seem like an unlikely pair, Eden Saadon, a young and talented textile designer from Israel, has used 3Doodler, the world’s first 3D printing pen, to challenge convention and push forward innovation in the world of fashion. "It is like a magical moment when the drawing transforms into an article"
Styles and trends constantly come and go in the fashion industry, yet the materials and techniques used to create those styles often remain stagnant. 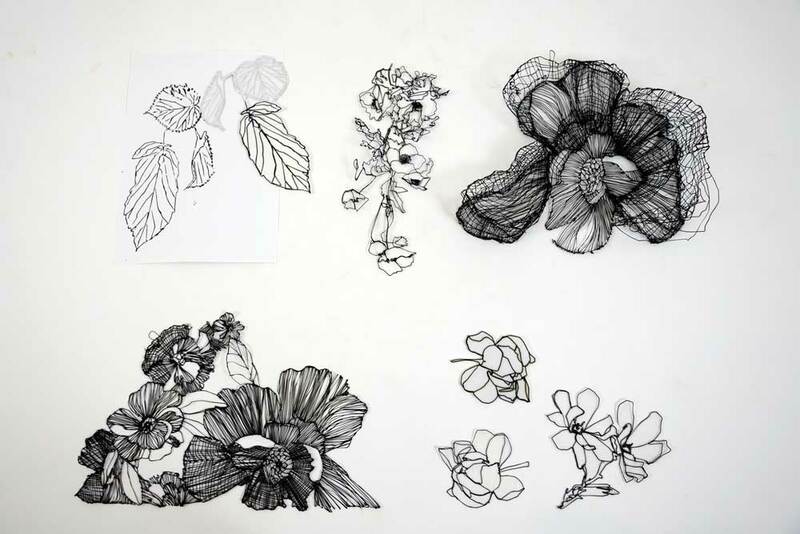 By combining the functional versatility of a 3D printing pen and her passion for fashion, Saadon has been able to add a personal twist to her textile creations. “It is like a magical moment when the drawing transforms into an article, and gets a new meaning,” she says. Eden’s Doodling journey began last year when she came across an Internet commercial for 3Doodler. She states, “The simplicity of producing a 3D structure demonstrated by the little girl in that commercial struck me. I ordered that pen and started experimenting with it.” Some of her first projects include Doodling a glove and a bra, where she utilized the 3Doodler Create’s ability to create a small article of clothing that could maintain shape, have flexibility, and fulfill a functionality. "produce surfaces that had textile qualities, such as draping, movement, flexibility, and lightness"
From those first few projects, she later fell in love with FLEXY, which is a specific plastic from 3Doodler that allowed Eden to “produce surfaces that had textile qualities, such as draping, movement, flexibility, and lightness by drawing a 3D structure of varying density.” These discoveries were incredibly exciting as she realized that she could apply the techniques that she learned from her classes and integrate them into her art creations. A few examples of the techniques Eden has used are lace knitting, embroidery, and Jacquard weaving. 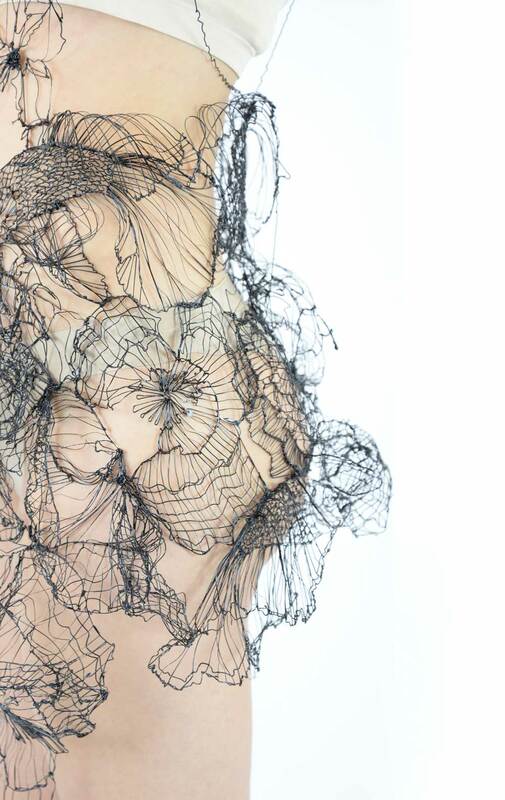 Over the course of approximately 1 year, Eden used her talent and creativity to create an entire collection of delicate lace feminine garments titled “Flexy Black,” which was inspired by the name of the 3Doodler plastic she used to develop the designs (FLEXY). Her work has not gone unrecognized. With leaders of the industry interested in her work, Eden has been presented with numerous opportunities, such as being invited to exhibit her designs at New York Fashion Tech Week, participate in New York Textile Month, and even have her designs published in the September NYTM grand publication. The novelty of Eden’s designs comes from the fact that 3D printing pens are able to create and design the fabric seamlessly (no pun intended!). There are no stitches, and the garments are truly personalized and custom-made for the user, without the need for a layout. In addition, fashion designers using 3D printing pens are able to comfortably explore bold ideas and trends due to the versatility of the pen. There are countless design possibilities that can be made with the 3Doodler Create, with the huge variety of plastics available, such as Glow-in-the-Dark and transparent, all of which may be more difficult to replicate when using traditional fabrics. From a practical standpoint, users can Doodle on any extra features to the design even at the last minute.. Though for Eden, she says she is just getting started. Eden’s next project is Doodling shoes for the NYFT Week Running show; in addition, she will start trying out the 3Doodler PRO and experimenting with different PRO plastics, such as wood, metals, and other materials, to integrate new materials into her designs. "Practice and research on new designs for hours every single day. " “This is a fantastic opportunity for me to get exposure in this great production,” she states. From being a young graduate in Israel exploring the beautiful nexus of fashion and technology to being a recognized textile artist presenting in New York, her story inspires us to think outside the box (or fabric, in this case) and challenge convention. In transforming something from plastic to fantastic, Eden is a fierce living example of the endless possibilities that are possible. Don’t let the possibilities end with fashion. Check out how to use your creativity for college dorm decor by clicking here. Let Eden’s story touch and inspire you to dream unlimitedly and create boldly. For a library of images in this blog piece plus more images of Eden’s work, click here. Learn more about Eden and her work on Facebook and Instagram.